What a fun birthday day my wonderful hubby threw for me! 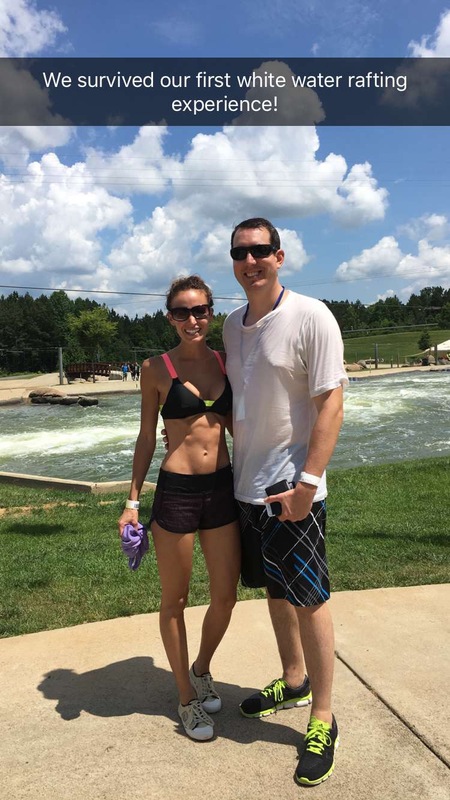 He knows that I love to workout and be active, so he planned a great day at the U.S. National Whitewater Center in Charlotte. We had never been there before, but had heard wonderful things and couldn’t wait to see it! 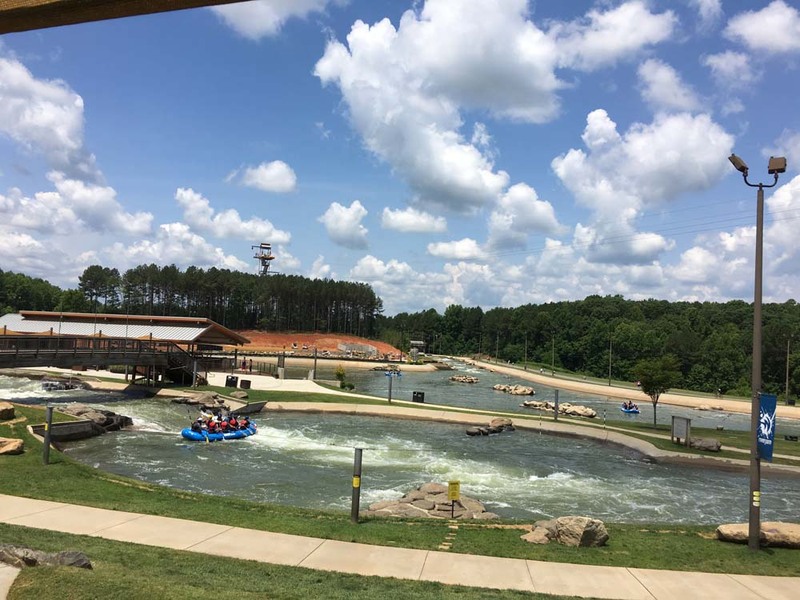 The Whitewater Center has rope courses, zip lines, hiking / mountain bike trails, rock climbing and of course whitewater rapids. For $60 you can purchase an AllSport pass, which gives you access to all activities, all day. There is so much to do at this place that you can easily spend the entire day there. 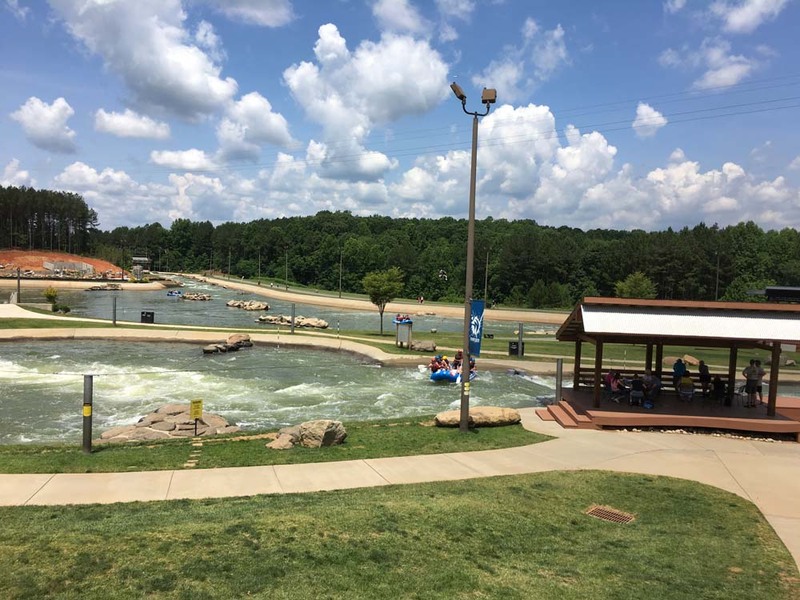 For example, we got to the Whitewater Center when it opened at 10 am, and by 3 pm we had been through the whitewater rapids once, completed a three-mile hike, enjoyed lunch and went rock climbing, and there was still a ton left to do! Since we went on a weekday, there weren’t any lines either. 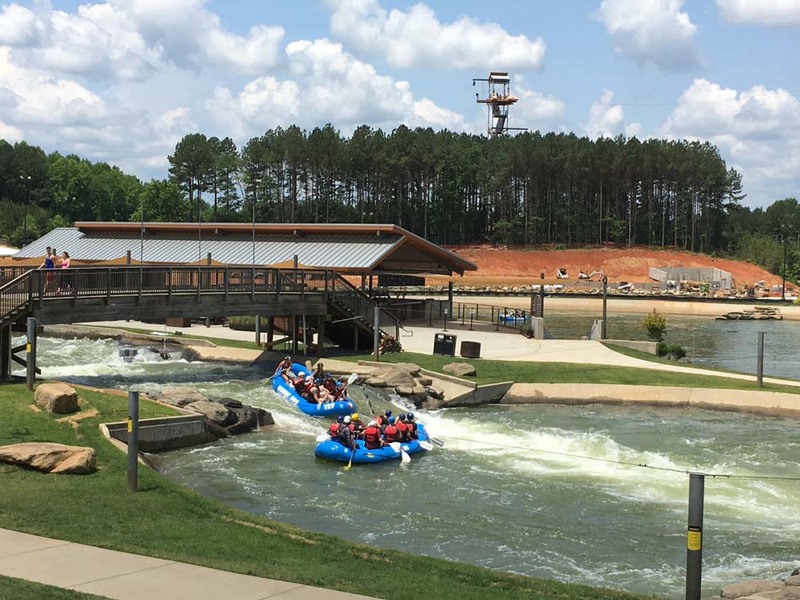 We started the day with the main reason people visit, the whitewater rapids. I can’t lie- unlike Kyle, I was super nervous! Before you get out on the water, you have to go through a mandatory introductory course, which I thought would put me at ease, but honestly I was even more nervous when they kept talking about falling out of the raft! We suited up and got partnered up with a fun family (who – to my dismay – were also on Kyle’s side wanting a wild ride). I thought about chickening out, but our guide was awesome and put me at ease – thanks Jacob! He gave us a fun ride without throwing anyone off the raft. We did see a lot of swimmers, though, but none of them looked panicked- they were actually laughing the rest of the way down! I still don’t think I’m brave enough to actually want to get tossed out, but I can say the ride was really awesome and I am so glad I did. I will go back for sure! 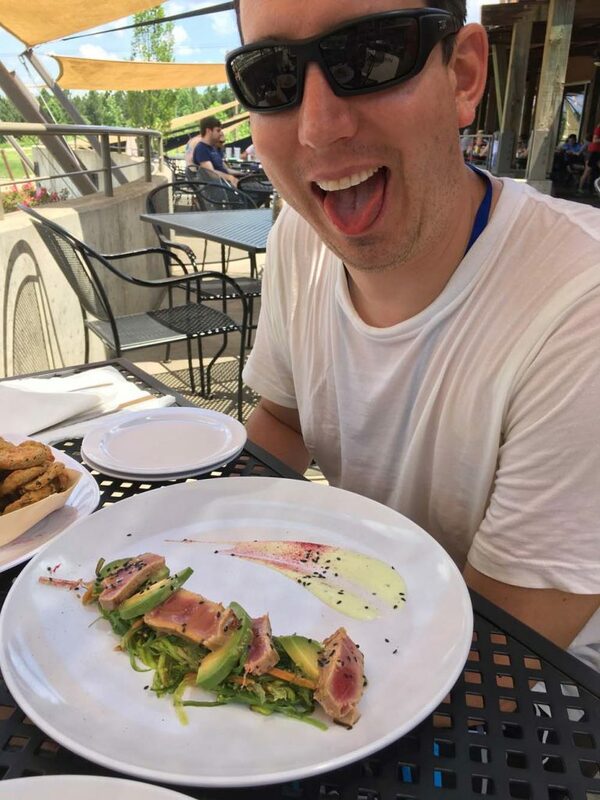 After the rapids, we ate lunch at the Riverside Grill on property, which blew us away! They had so many healthy – and unhealthy options – really, there was something for everyone on the menu. 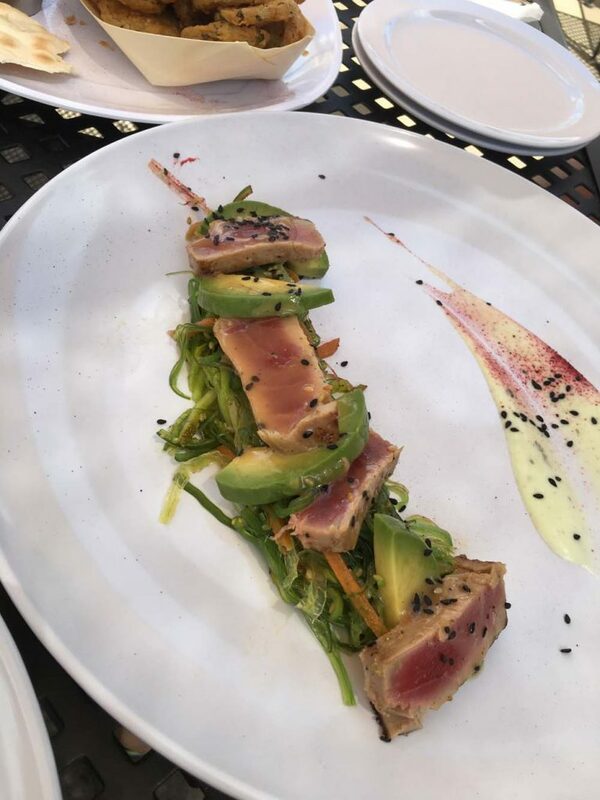 From Tofu (which is what I had) to Ahi Tuna (Kyle’s dish) to big ole’ burgers (which we saw many people enjoying), the food was excellent! Also, I’m not a beer drinker but if you like craft beers, you will love this place. They also have a bar and a market place where you can grab a quick drink and snack. We then changed out of our wet clothes and went on the bike / hiking trails. We took the North Trail, which loops you past the river where we saw people paddle boarding and kayaking. 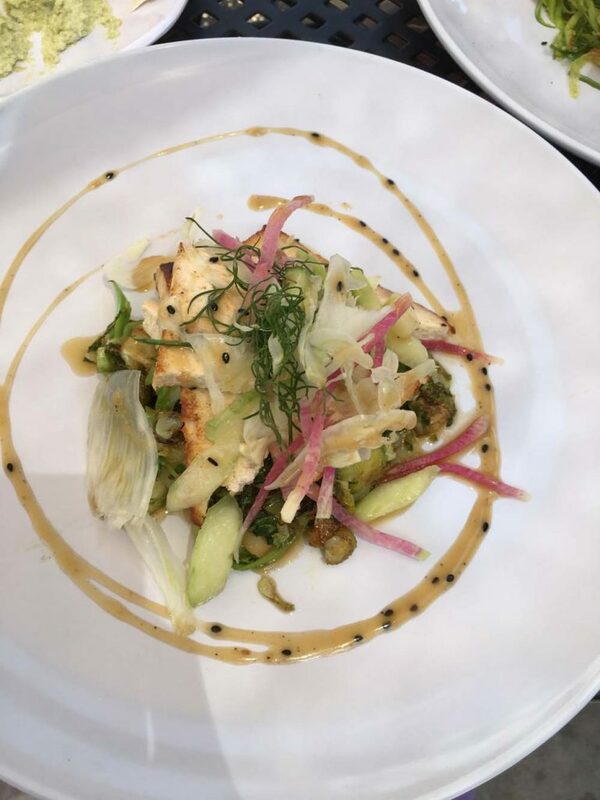 We can’t wait to go back and try that next time! After finishing our pretty hike, we were running out of time so we went to the rock climbing wall and made a few passes. Wow, talk about a workout! 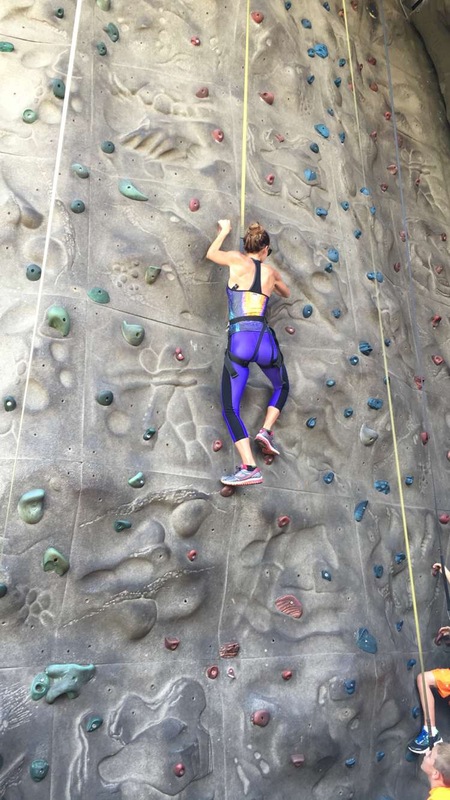 They have three different levels – beginner, intermediate and advanced – so nearly anyone can give rock climbing a try. 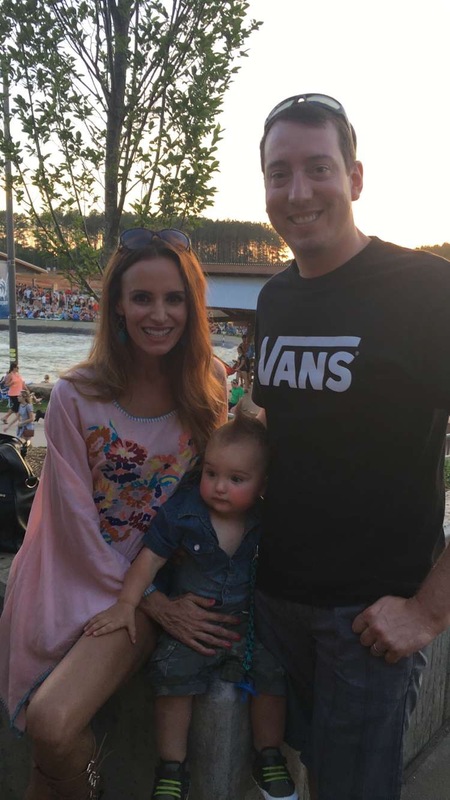 We had heard so many great things about the zip lines and ropes course and really wished we could have checked them out, but we ran out of time. 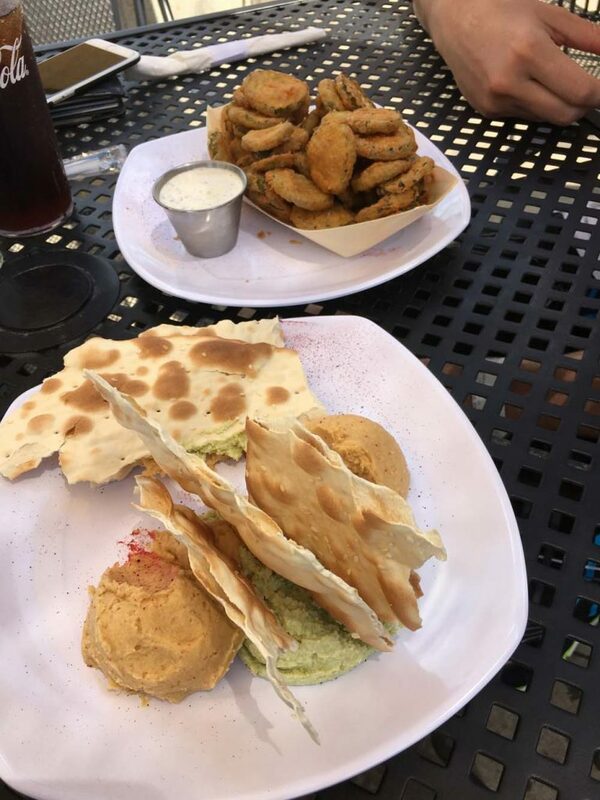 Next time we’re there, we will be sure to try them! 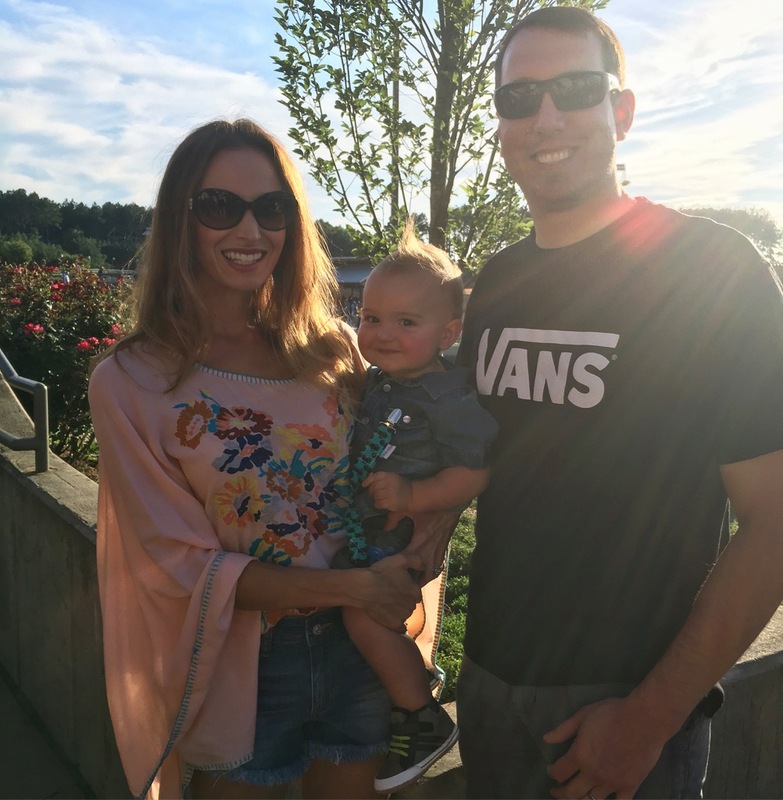 The Whitewater Center is a great date idea or just a fun place to take the family if the kids are over eight years old. Younger kids would definitely like to run around on the lawns, but know that there isn’t a fenced off area so the rapids river is completely open. 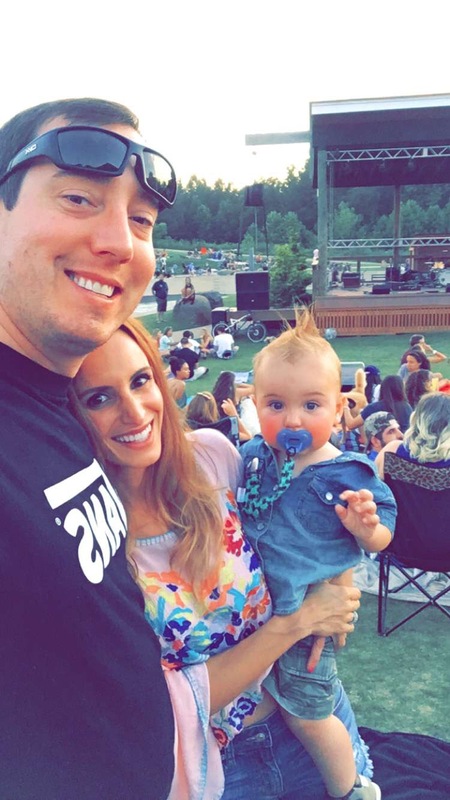 On Thursdays and Saturdays there is a live band and people sit out on the lawn with their kiddos and watch the rafters. 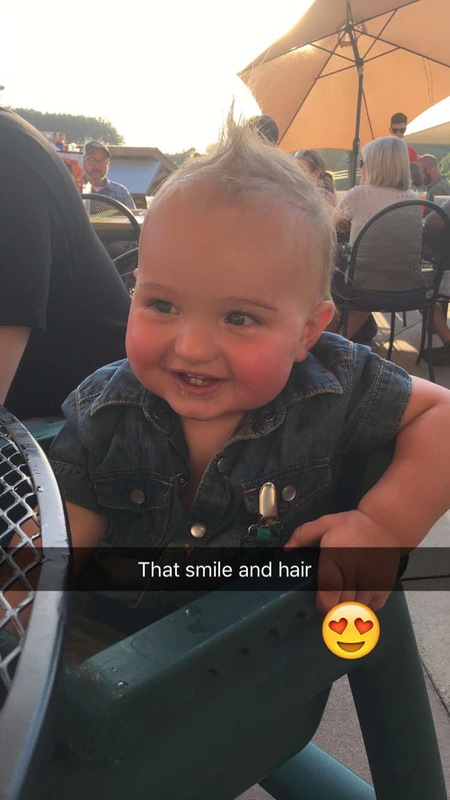 If you go, I hope you enjoy your time as much as we did, and please share your experience with me!